The cat & dog dander allergy test panel measures cat & dog dander IgE antibodies blood levels. What is the cat and dog allergy test panel? A cat and dog allergy test panel measures the IgE antibody blood levels to cat and dog dander. Why is the cat and dog allergy test panel important? This cat and dog allergy test panel checks for evidence of an allergy to cats or dogs. This Cat & Dog Allergy Test Panel is a blood test. The cat and dog dander allergy test, also known as a pet allergy test, cat and dog allergy test, and pet IgE test, measures the IgE antibody blood levels to cat and dog dander. This cat and dog allergy panel is a combination of the individual cat allergy test and dog allergy test. To get a cat and dog dander allergy test panel near you, simply order online and get your blood drawn at the Quest Diagnostics' lab near you. 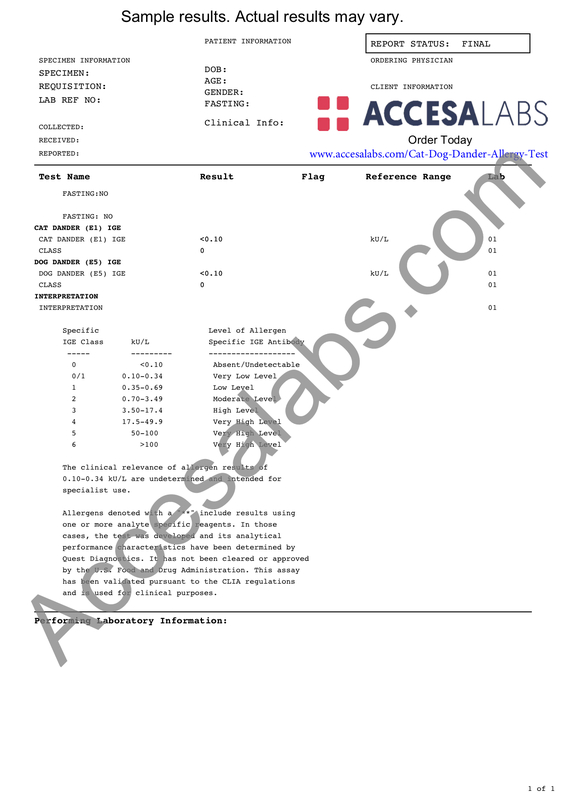 Once your lab results are ready, they will be available for download. This cat and dog dander IgE test uses the ImmunoCAP® lab methodology. Cat and dog dander IgE antibody blood test results are reported in kU/L and can be compared against the IgE antibody reference range provided by the lab to determine the IgE allergy class to cat and dog dander. While cats and dogs bring lots of joy to our lives, pet allergies are not enjoyable. Besides considering medical allergy treatments there are other ways to reduce the symptoms of pet dander allergies. When possible, washing your pets regularly may help reduce the amount of dander being shed. To remove pet dander from carpets and rugs, vacuum and, if possible, shampoo them regularly. Cleaning off home furnishings with soap and water may also help remove any irritating cat and dog dander that is stuck to furniture. Cat & Dog Allergy Test Panel at Guaranteed Prices.